Bungle Inthejungle made a name for himself as an inexpensive but prolific source of winners with his first two-year-old runners in 2018 and he is reinforcing that impression with his second crop in the early weeks of the Flat season. Zulu Zander became the son of Exceed And Excel's first juvenile scorer of the new campaign with a three-and-a-quarter length success for David Evans in a Leicester novice stakes earlier this month, and George Cornelius blew his rivals out of the water in a median auction maiden over the minimum distance at Dundalk on Sunday. The Kieran Cotter-trained George Cornelius soon took up the running and galloped on strongly, gradually put more and more distance between himself and the other six competitors with the winning margin standing at ten lengths. “He's been working very well with some of our other two-year-olds and it augurs well for the rest of them,” said Cotter after the race. “We've never had him off the bridle before and have just been trying to keep a lid on him. The colt, showing considerable maturity despite being foaled late in the season on April 28, was bred by Bungle Inthejungle's owners Rathasker Stud out of the placed Aqlaam mare Havinaconniption. Havinaconniption is out of the Group 3-placed Spartacus mare Undaunted Affair, a half-sister to Listed scorer Faustina. George Cornelius was sold by Rathasker to Danny Murphy and jockey Mark Gallagher for €29,000 at the Goffs Sportsman's Yearling Sale, and now carries the silks of Stuart John Robinson. Bungle Inthejungle stood his first four seasons at Rathasker at a fee of €5,000, but received a pay rise to €12,000 this year on the back of his freshman success. His best runner to date is impressive Molecomb Stakes winner and Middle Park Stakes third Rumble Inthejungle, who is being targeted by trainer Richard Spencer at the Commonwealth Cup, and he is also responsible for Italian Listed winner Sopran Artemide. 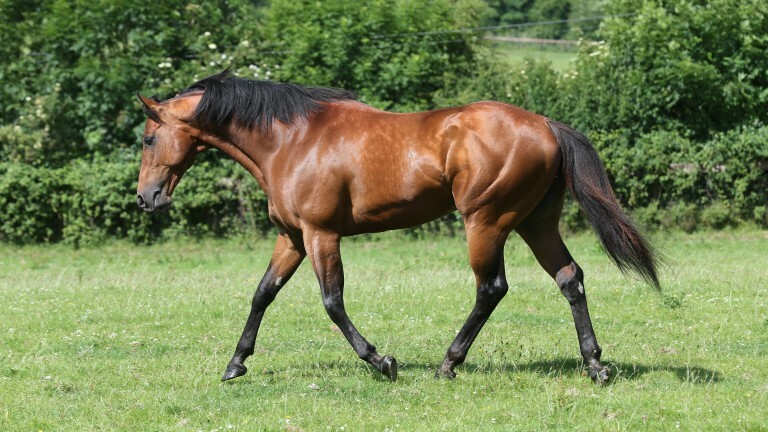 Another promising performer for the sire is Eljayeff, who won novice stakes at Carlisle and Ripon by clear water both times for Richard Fahey last July.